When I spotted the original Eye-Fi card I was stunned by the concept - which allows you to take photos, and upload them from your camera directly as soon as you get within range of a WiFi network - however I still haven't got round to purchasing one. The launch of the latest version - the Eye-Fi Pro, now has me considering it - because they've now added raw file support. The Pro version also uses Skyhook to automatically geolocate your photos by referencing the WiFi networks it could see at the time you took the shot. I can see this working in cities, but when I'm out taking landscape shots up in the mountains, I'll still be relying on my GPS. 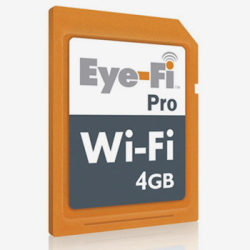 See the Wired product review of the Eye-Fi Pro for more info, or go direct to the Eye-Fi website.